On Thursday, September 14, 2017, Lampeter-Strasburg traveled to Ephrata Mountaineer Field. Per usual, we were expecting nice wins to come home with, but only one of the Pioneer soccer teams would actually come away with a victory. The Junior Varsity game, which started at 5:45 pm, fifteen minutes later than it was scheduled, went nice and easy. Though Jacky Shultz, a junior that usually plays center defense, didn’t start either of the two halves, the Pioneers still played just as strong in the start of the game. The Junior Varsity ended up winning their game 1-0. The goal was scored by Emily Snyder. This goal was the first of the freshman’s high school soccer career, and hopefully the start of a long line. The JV team then sat back and prepared for Varsity to gain a similar win. Unfortunately, the Varsity team wasn’t blessed with the same results losing, 2-1. 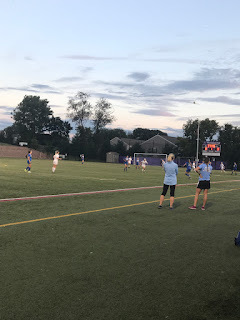 Ephrata scored early on in the first half of the game, and it wasn’t until a mere 16.5 seconds were left on the clock that Hannah Adams, captain of Varsity along with Kendall Ream and Bella DiCamillo, shot and made a goal with an assist from Maddy Stabinger. The second half of the Varsity game kept up the intensity and, unfortunately, saw an early score by #17 on Ephrata’s team. The girl managed to score a mere 4 minutes and 24 seconds into the second half. The Pioneers fought and tried their hardest to come back strong, but they were unable to tie back up the score. This loss was a tragedy, but the girls who played their hearts out are not to blame. They came out onto the field, played until their lungs were giving out, pushed further, then walked off the field with their spirits low, but chins up. The Girls' Soccer team found redemption last night when they defeated Garden Spot, 2-0. The team’s next game is Wednesday, September 20, at Cocalico High School.